Day 1 of WDW-40, 2016, the latest of my Disney Trip Reports, is here! 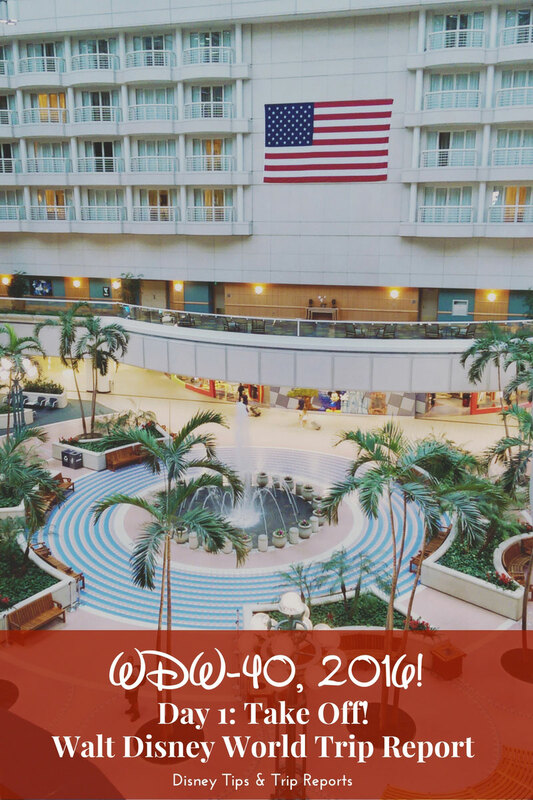 Today we jet off to Orlando, and have quite the eventful flight… so glad we booked to stay at the Hyatt Regency, Orlando International Airport Hotel that night – we would have been too shattered to begin a 2 hour drive to Vero Beach that’s for sure! We woke up pretty early – but the nerves were already kicking in for me. I’m not scared of flying, but as I’ve got older I get quite a sick feeling on flight day. We’ve flown so much over the past few years, so it’s weird I still feel this way. I generally spray some Bach’s Rescue Remedy to alleviate the nerves. To that end, I was in no mood for breakfast, but Steve went down to get some for himself. He ended bringing back some breakfast for me – just in case I changed my mind – bless his thoughtfulness! Breakfast at the Premier Inn is served buffet style, and you can help yourself to as much as you like. It is standard hotel fare, with items for a cooked English breakfast, cereals, fruit, yoghurt, and baked goods. On travel day I like to get to the airport nice and early – even though we don’t have to, thanks to twilight check-in the day before. I’d rather just be through security, and be able to chill out and wait for boarding. I had organised special assistance for me via British Airways’ website, as I knew I wouldn’t manage the long distance walking. I’m so glad I did too, because BA’s gate had changed this year, and was a lot further away. We were allowed to pre-board which calmed my nerves, and I made myself as comfortable as I could. We flew to Orlando in a British Airways, Boeing 777-200 Three Class V2 in World Traveller (economy) – the seats are 18.1″ wide, with a 31″ pitch. The seats are in a 3/3/3 formation. We sat in seats 25E & F, which is the middle bank of seats. Seat 25D is actually reserved for Cabin Crew, so during our flight, we had extra space. At my size at the time of going (UK30/32, maybe even 34 – depends where I shop for clothes) I did fit in the seat, and was able to have the arm rest down during take off and landing. I did need a seat belt extension, which I always have done, as I carry most of my weight around my belly. I sat on the aisle side, and was also able to lift the armrest on the right side of me, as well as the one between my husband and I. For the armrest on the aisle side, there is a little hook button underneath towards the back which you can slide to move the armrest – it makes getting out of the seat a lot easier. We were very near to the toilets, but being in the middle of the aircraft, there isn’t much room to walk around, unlike at the back near the galley. We picked these seats based on the aforementioned extra space via the Cabin Crew seat – we normally choose seats at the rear of the plane to have the space to walk around during the flight, and I missed that. The toilets were very snug for me, but I just about managed. I hope to be a few sizes smaller by the time we go on our next trip to Orlando – the flight was just about bearable for me this time around. For the food service, the tray table wasn’t going to lay flat for me, so basically Steve and I shared his – plus we did have the bonus of the spare one next to him as well. For those new to my trip reports, I’ve flown to Orlando from sizes UK24 and up. I’m sharing this info because I know that other plus size passengers do worry about fitting in the seats. I hope my description helps to settle your nerves. Take off was exceptionally smooth, and most of the journey was too – I don’t think the seat belt sign came on once during the flight. We had our first round of drinks at the beginning of the flight – but no little bag of pretzels! Cost cutting measure there I think. Lunch was served with a few more cost cutting measures compared to previous flights – in the past we’ve had a small bottle of water, but this was a tiny plastic cup of the wet stuff. Cheese and crackers were also notably missing! Not too much of a big deal about that, but we definitely missed having the bottle of water – it was handy for taking a sip, and then putting in the pocket in front of you for later in the flight. I remember aeroplane food being awful when I was a kid, but it seems to have improved a lot over the years. The starter was a lemon and mint cous cous salad. For main course, I had a mushroom lasagne, and Steve had sausage and mash. We also had a herb bread roll and butter on the side, and for dessert it was an apple and blackcurrant cheesecake. Everything tasted fine. Inflight entertainment was good – I ended up watching four films – Zootropolis, Angry Birds, Kung Fu Panda 3, and My Big Fat Greek Wedding 2. I’m pretty sure we had a snack provided later in the flight, but I don’t seem to have any photos, or anything written down. I know we bought some small pots of Pringles at a £1 each! Shocking price! I know snacks used to be free on the long haul flights, so another cost cutting measure there. As we approached Orlando, the pilot said that there was a bad storm which had shut down the airport, and we would have to do a bit of circling over the ocean to wait to land. We carried on watching a film, and just had to wait it out, hoping it wouldn’t be too long. The pilot then announced that we would have to divert to Tampa to land and refuel… So despite the smooth flight, it ended up quite eventful in the end! There was a family sitting next to us and mentioned how they were actually driving from Orlando to Tampa – and now they were here, but of course, couldn’t get off the plane! Eventually we took off again, and 3 hours late, we landed in Orlando. I had assistance once again, which was very helpful, and took away all of my anxieties as well. I was so glad that we had booked to stay at the Hyatt Regency, Orlando that evening, because we would not have been able to safely drive to Vero Beach that night!